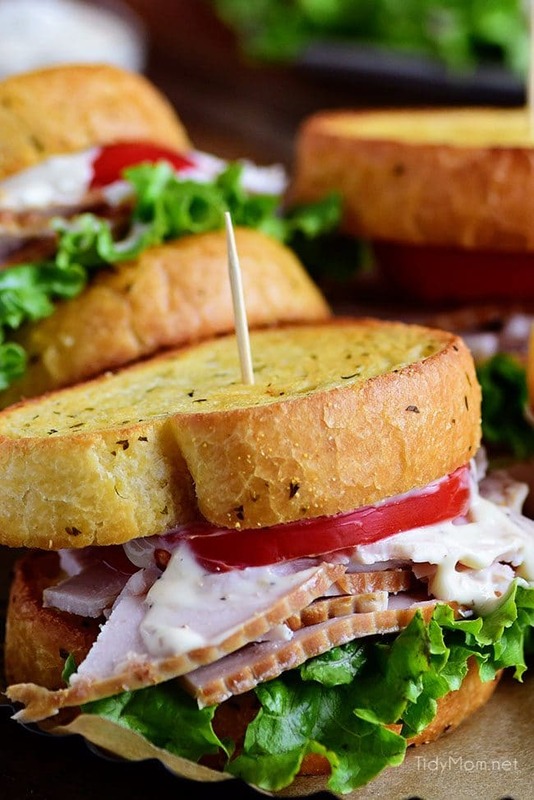 Texas garlic toast turns an ordinary Turkey Caesar Sandwich into something special. It’s the perfect way to use up leftover Thanksgiving turkey or enjoy any day with deli sliced turkey! Thanksgiving leftovers are as much a part of the holiday tradition as the feast itself. There’s no better way to enjoy leftover turkey than a delicious turkey sandwich than a deconstructed turkey caesar salad. My family loves this Turkey Caesar Sandwich so much, we almost can’t wait for Thanksgiving to be over! The best part of this sandwich is that it’s made with warm garlic toast! and it’s SUPER easy to make!! While you can enjoy this turkey sandwich any time using deli turkey, it’s a whole other level of good with leftover turkey from Thanksgiving!! While the garlic bread slices are toasting in the oven, you want to mix up a little mayo, parmesan cheese, garlic, dijon and lemon juice for the spread. Once the toast comes out of the oven, spread the mayo mixture on one side of each piece of warm toast. Then pile up as much turkey as you want on four of the slices of toast add a tomato slice and lettuce and place the four remaining slices of toast spread side down on top and serve! That’s it!! Yes, your hands are going to get a little greasy holding on to a garlic toast sandwich……but that is the part that makes this sandwich SO DARN GOOD!!! TRUST ME……if you like a turkey Caesar salad, you are going to love this Turkey Caesar Sandwich!! Today the classic Caesar salad consists of romaine lettuce and croutons dressed with lemon juice, olive oil, egg, Worcestershire sauce, anchovies, garlic, Dijon mustard, Parmesan cheese, and black pepper. Tired of the same Thanksgiving leftovers? If your fridge bursting with leftovers, I’ve got your back. From soups and sandwiches to casseroles, there are so many great turkey recipes (and chicken recipes) that will make your leftovers anything but boring. 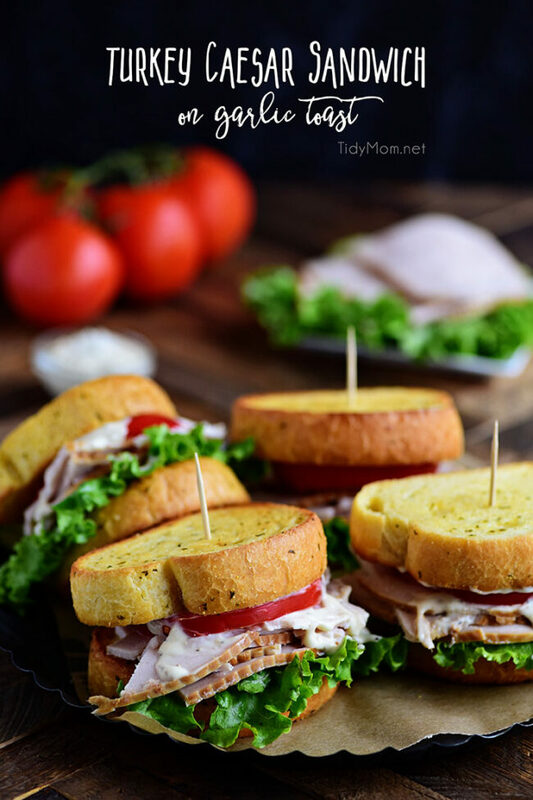 Roasted Turkey, Apple & Cheddar Sandwich is packed with flavor and makes a quick, easy and delicious meal! 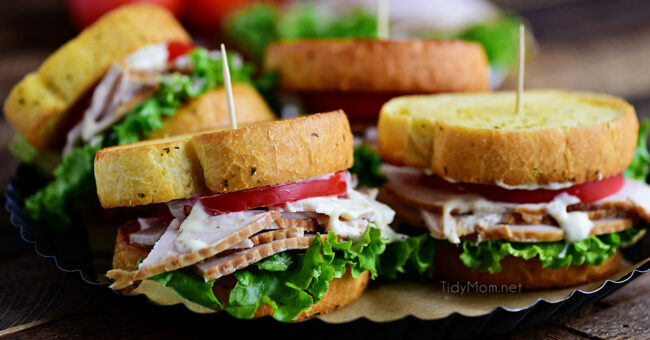 A favorite Panera restaurant sandwich gets a little healthier when you make it at home! Turkey, white cheddar, crisp apple slices, and a crunchy tangy cranberry walnut slaw are slipped into a flatbread sandwich. Thanksgiving Turkey Gumbo Is the ultimate recipe for turkey day leftovers. It reinvents the turkey and creates a meal fit to feed all your lingering guests… or family. It’s also cozy, easy and full of so much great flavor!! Creamy Dill Chicken Salad is a twist on an old favorite with tons of room for variations like leftover turkey instead of chicken! Serve on a bed of lettuce or on your favorite bread for a lunch you won’t regret! 20 Minute Chipotle BBQ Cranberry Turkey Sliders (or chicken!) with Apple Poppy Seed Slaw They are a wonderfully delicious way to devour your Thanksgiving turkey leftovers or SO good you will want to make them forever and ever with chicken! The crunchy, sweet and tangy Apple Poppy Seed Slaw is delectable all on its own and the ideally delicious compliment to these saucy sliders! Turkey Cranberry Hand Pies The perfect after-Thanksgiving snack, lunch, or dinner using leftover turkey and cranberries! Don’t be intimidated with hand pies, they’re a cinch to make – you can even get the kids to help. Slow Cooker Turkey Barley Soup A light and healthy soup to help you recover from your mashed potato coma. Thanksgiving Pizza It has turkey, mashed potatoes, stuffing and more all in a puff pastry crust! I just might be the BEST way to eat Thanksgiving leftovers. Chicken and Spinach Enchiladas Casserole comes together quickly with leftover turkey and tastes rich and savory, bursting with flavor! 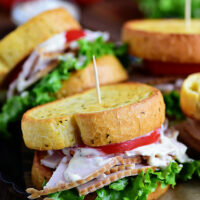 Like this Turkey Caesar Sandwich Recipe? Pin it! 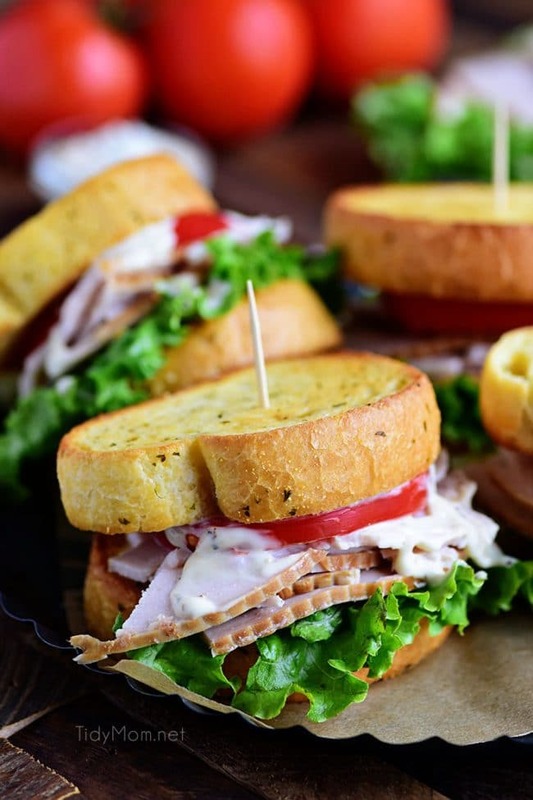 This tasty Turkey Caesar Sandwich has the ease of a cold cut sandwich with the taste of warm toasted garlic bread and Caesar salad. Bake garlic toast slices according to package directions. In a small bowl combine mayonnaise, cheese, lemon juice, mustard, and garlic. Remove toast from oven and spread mayonnaise mixture on one side of each of the 8 slices of toasted garlic bread. Top 4 slices with turkey, lettuce, tomato, and remaining toast (mayonnaise side down). Mmmm, this sounds so good! I’m not hosting Thanksgiving this year so if we don’t snag any leftover turkey I may have to pick up some deli turkey. Thanks for the recipe! I am serving Bob Evans Mashed Pototes for Thanksgiving Holiday. Can they be warmed in crock pot and if so, how long per package? When my folks lived away and it required us all to travel, and stay, we found the best way to utilize the leftovers was to make the next day casserole. We’ll start with turkey and layer the peas, corn, stuffing, cranberries, etc. , top it off with the potatoes and a pouring of the leftover gravy. It usually made a roaster full and was a great way to feed the whole crew one more day AND have all the leftovers gone at the same time. No wondering what you’d do with a bowl of potatoes etc. and nothing to go along with them. Thanks so much for including my Turkey Wrap Sandwiches in your round-up! I hope you and your family have a wonderful Thanksgiving! I’ve never thought of a turkey caesar sandwich so thanks for the very appetizing idea! My favourite part of Thanksgiving dinner is the leftover turkey. Always make hot turkey sandwiches and homemade fries with leftover stuffing! Happy Thanksgiving to you and your family Cheryl! Turkey Caesar sandwiches sound delicious! And I’ve never tried Bob Evan potatoes….I think I need to! The sandwich looks wonderful! No shopping for us! We just had a fun day, ice skating, out to lunch and a movie! Yum! We feasted on leftovers all day! So many delicious ideas for leftovers! Love this left over use of turkey. My husband in and while be loving this recipe all week long. I can’t wait to try this. My husbands grandmother is doing Thanksgiving this year and we were told to bring lots of tupperware for leftovers. He gets really excited but I have turkey coming out of my ears after a few days. But this sandwich will definitely break up the turkey boredom. Thanks! perfect leftover recipe! Happy holidays!